Lauren is a sponsored rider for Barastoc, who provide her performance horses with quality equine feed throughout the year. Barastoc is also supplying the equine feed for the 150 Adina Polocrosse World Cup competition horses, ensuring that all of these horses are fuelled and ready to compete at the elite level in Warwick during the event. All horses which have been loaned for the World Cup have been on Barastoc Complete Performer and/or Barastoc Command feed for the 10-12 weeks leading up to the competition. When these horses arrive at IOR Morgan Park, from 12 April, they will continue their strict Barastoc feeding program, with Barastoc donating all of the equine feed for these horses for the duration of the World Cup. When Lauren started using Barastoc feed 12 months ago, though her horses’ training regime remained the same, she noticed a significant improvement in their abilities. “They have never looked so good or played so well. Now they have a lot more stamina when they play polocrosse. The feed helps them cope with the intensity of the sport,” said Lauren. “A lot of science and research lies behind the Barastoc feed mixes” she added. Which is your best horse and why? Our horses have different roles. There are three positions in polocrosse so we have horses tailored for those positions. But my favourite horse is my mare, Rosebrook Diamonte, 14.3hh, bought from the Rosebrook stud. She’s a little pocket rocket; she could go all day. She’s got lots of energy. Because of this it can be hard to find the right feed for her, but Barastoc has been keeping her consistent. Diamonte is my favourite because she suits how I play. Everyone has their own style of playing polocrosse. As a Number 1 position (goal shooter), I like to weave in and out of players and stay away from contact. Diamonte takes off so fast in her first three strides that not many can keep up. This is one of the qualities of her breed, Australian Stock Horse. She is also fast under gallop. She has stamina; she can go all day, and she’s very versatile. In the sport we play, horses need a bit of maturity because it is physically very demanding. Diamonte is ten this year, and mares play best between ages 10 and 13; their bodies have developed enough to handle the pressure. Unfortunately, Diamonte won’t be in the World Cup pool of horses due to an injury from the Australian Nationals in October. She’s not quite right yet. How do you introduce and train your young horses for a career in polocrosse? We breed our own lines just for us to play polocrosse. We sell a few horses but mostly the breeding we do is for our own enjoyment. We love the game so much and we want to be able to play our best polocrosse. We are a bit different; we start our horses playing polocrosse a bit later than most. Two-year-olds are broken in and taught the basic foundations in 2-3 weeks of work. We are slow and steady with them and get them used to racquets and balls. Their first outing will be when they are about 4 years old, to umpire or throw the ball around with friends at a carnival, but not to play in a game. At 5 years old our horses go to 1-2 carnivals a year. Then they go back to the paddock to think about it and for their bodies to develop. Then at about 6 years old they get a lot more fitness training, go to a lot more carnivals and feel the pressure of playing every weekend and bigger competitions. 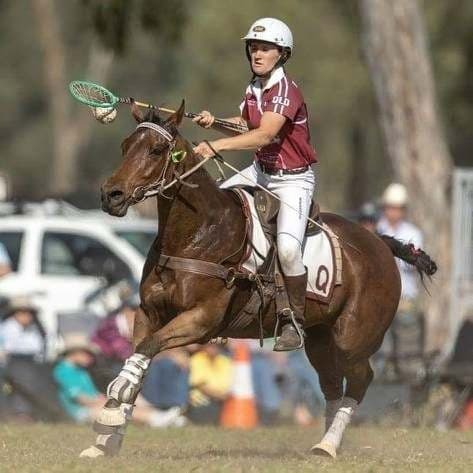 Because the polocrosse season is so long in Queensland (March to September), we can play a couple of horses over a year ; and we don’t want to tire out one horse by playing them the whole season. I have the 10 year old, a 5 year old, and 3 and 2 year olds coming along. We start the season with our favourite horse, give them a spell in the middle of the year, and bring out the best horse again for the Nationals. My husband and I have 6 horses between us – 2 top horses, 2 new horses beginning to play and 2 younger ones. How does your horses’ training change in the lead up to a competition vs. off season? When we come into the season, we do lots of fitness training. We leg them up before the season – building up their leg muscles through long distance runs. Flat work is the hardest part of riding horses. This is getting all the bits that make up the game working properly, like turning, and transitions between galloping, stopping and turning, so the horse has no hesitation on the playing field. Once the season starts we go away every weekend so we don’t have to do distance work so much. We keep them fresh but still fit. We do sprints occasionally. My husband’s mare keeps weight on; it’s hard to get weight off of her so once or twice a fortnight (two weeks) we do sprints to take off her weight or else she is slower and sluggish on the field. A young girl, Brooke, lives with us and we go out every day to throw around the ball and get the horses used to racquets. We teach the young horses to track and follow the ball across the field so we don’t have to lean right out of the saddle when we go to pick up the ball. What do you feed your horses for maintenance (off season) vs. preparation for a competition? We live on 80 acres, a lot of land for the number of horses we have. In the off season they eat pasture, along with lucerne and oaten hay if we feel they need a little extra. Horses need a lot of this roughage to keep their guts healthy. I’m from Western Australia where we had to feed the horses in off season. Here the goodness in the soil is enough for them. Our brood mares and foals also get Barastoc feed so the mares don’t lose condition while growing and feeding babies. After a match, how do you support your horse’s recovery? We use Ceva products to help replace what is lost by the horses between games in competition, similar to how human athletes replace electrolytes lost through sweat, as a pick me up. Monday is always off – mainly because we need the recovery day! The horses wander around and feed. On Tuesday we do light work with the horses to stretch their muscles and get rid of aches. Wednesday to Friday is training, and depends on what the horse needs – no two weeks are the same. A horse might need an extra day off, or need extra sprints. We know these horses inside and out, so we can read what they need. What physical training are you doing for the Adina Polocrosse World Cup? I’ve been doing strength training lately; I always do this before the season. Now that the polocrosse playing season has started, I’ve backed off the gym to focus on riding and playing. Polocrosse is a physically demanding sport. We need our core to be really strong so it’s easier to hold racquet, guide the horse and ride all at the same time. Otherwise, you could lean out for the ball and fall off. My trainer is my friend, Lauren Sibley, the manager of Albury World Gym. Under her program I’ve seen such a huge improvement! A trainer can help us get to where we need to be. Muscle makes it easier to play. My favourite sessions are the two high intensity interval training session I do each week. They are quick, I smash it out, work really hard then feel amazing afterwards! I’m doing my training by myself on my own set up of equipment. Lauren’s program is based on what I have. I give her progress updates and she tweaks my program based on my needs. You and your husband were recently at a Pony Club rally. What were you up to? Pony clubs ask us to come to rally days. Queensland Polocrosse Association has a bag of racquets and balls. We teach the young kids the basics of polocrosse and introduce their horses to the equipment. It’s a way to develop our sport. How did you get started playing polocrosse? Is there a lot of competitiveness between the countries’ teams for the World Cup? In our sport we go around the world to play. We are good friends with most people in the World Cup teams. Polocrosse is very social. There’s always a friendly rapport, even though there is rivalry on the field. There’s not many sports that happens in. Because we are at carnivals every weekend, we live with this community. We go everywhere together. It’s great for kids too! Images: Lauren’s family life is intertwined with polocrosse: with husband, Chris and son, Chase. How do the World Cup teams play differently from each other? Australians play a horse-oriented game because we have the strong and versatile Australian Stock Horses with great stamina to ride. We ride from wherever we are to the ball. The South Africans emphasise ball-passing so as not to wear out or waste their horses. Where we would carry the ball all the way to our number one, they would throw it to their number one. It’s exciting to watch South Africa’s incredible ball skills, and it’s very intense when these two styles play each other. We have made some adjustments to how we play the game. From the horse pool I might not get a horse that is quick like my mare, or who can gallop for four chukkas. We are practicing passing more, and practicing better management of the horses. Keep an eye on the New Zealand team. We had two friendly matches with them and from the first weekend to the second their improvement was huge! They see each other every weekend, whether they play together or against each other in club carnivals. Our team is improving as we find our feet with each other, and get to know how we each play. Otherwise, we might only see each other every two years! We are all watching how other teams play and trying to take the best from each team but we also stick to what we are good at. The World Cup will use international rules which have a couple of tiny differences to Australian rules, such as throwing overarm is allowed, where Australians only use underarm throws. We have practiced overarm and will use it if it gives us an advantage, but practice and play is very different! I like to sit up and run around the front of my opponent. I can make goals with my fast mare but an overarm throw can help overcome a Number 3 (defence) on a fast horse. It’s not natural to us Australians so it’s very hard for us. I’ll only use overarm if I’m confident the goal will happen or if I’m in trouble in the centerfield trapped in between two opponents (but we manage our players to always keep it a one-on-one game). Barastoc are horse people. They don’t just make feed. They support young riders, local communities and Aussie farmers. The health and wellbeing of horses is at the heart of everything they do. Their range of horse feeds has been created by dedicated nutritionists in consultation with the experts at Kentucky Equine Research. is tailored to the specific workloads and performance goals of horses. See the range of Barastoc horse feeds and find the right feed option for your horse. Drop in and see Team Barastoc in the trade expo area at the Adina Polocrosse World Cup 2019.